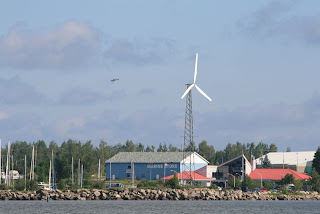 Our guidebook said two marinas on the North Channel were powered by wind turbines. 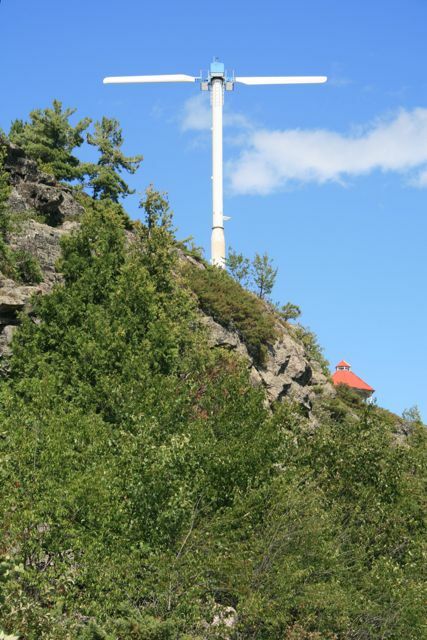 Both towers had been in place for more than a decade, so wind power was hardly a novelty there. 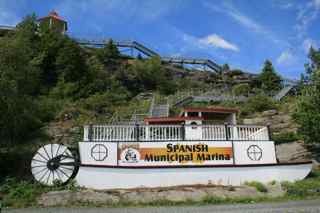 The turbine in the town of Spanish, said the literature, was “the first such device in North America to supply electricity to a ground-source heat pump.” Any extra power it generated was fed directly into Canada’s hydro-power grid. “Cool!” we thought. These are small towns (a few hundred to a few thousand people) in a remote area. Must be costly to run transmission lines out here. Seems like a great idea to develop energy self-sufficiency. As we approached Spanish, our flag flapped in a steady breeze of about ten miles per hour, but the wind turbine—an unusual design with just two blades, oriented horizontally—was still. 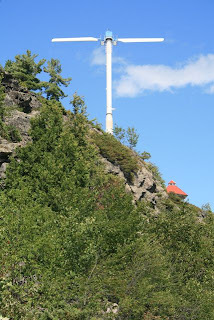 wind turbine. Why the stern wheeler? We don't know! About 28 miles down the coast, the waterfront at Blind River was also dominated by a prominent wind turbine—also with blades completely still. This one had stopped working a few months ago. Timetable for repairs—also murky. On the other hand, Blind River has been energetically exploring other ways to power itself with sustainable technologies, according to the publication Northern Ontario Business. For a while, a biomass energy project was in the works. But with the Canadian government getting into biomass in a big way, a consortium that included two local development groups plus an energy company concluded funding for the project was too uncertain, and instead the group started to consider a solar farm. That's an interesting idea: Instead of investing in land and infrastructure for a commercial solar farm, the town is encouraging individual citizens to make their collective roofs into a solar farm. The upside: You don’t take land out of use and dedicate it only to fields of solar panels. And, before a homeowner can score a government grant to support the purchase of solar panels, he has to make his home as energy efficient as possible--adding insulation, weatherstripping, and so on. The net result of those steps, taken by a large part of the population, would be significant energy conservation (never mind energy generation). The possible downside in a town-turned-solar farm—lack of centralization. Maintenance could be a headache. And it's probably more efficient to feed power from a conventional solar farm to the grid. What do you think? Great idea? or less than optimal use of government funds? And, if you know of other communities that are turning themselves into solar farms, we’d love to hear about how that all worked out--especially if the community is somewhere along our route!